This article will discuss about the relationship between engine speed, transmission ratio, wheel size, and speed of the vehicle. For more details about the function of RPM gauge on a vehicle can be read in the article What is Tachometer Function on Vehicle? Final reduction is the ratio between input and output rotation of differential, before rotational power is given to wheel. 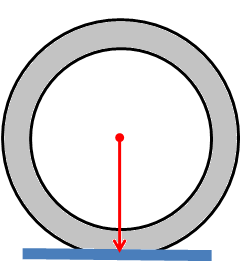 Final round of reduction will decrease and increase torque. On a motorcycle, the final reduction ratio is big chain sprocket on the rear wheel, divided by a small sprocket on the transmission output. Some vehicles are designed with more ratios, such as the ratio of primary and secondary, low, high, and others. If those transmission ratios are working at a certain speed, then those ratios should also be included in the calculation for that certain speed. You need to check your vehicle specification for gear ratio and final reduction to get accurate calculation result. Wheel size will affect the speed of the vehicle. Because wheel and tire are often modified, then the measurement of vehicle speed with the speedometer will be less accurate. To calculate the speed based on the engine RPM, then tyre circumference data is needed. Measurement of tire circumference is done by center of axle height from the ground and it is called tire rolling radius. Keep in mind that the height of center of axle from the ground will be slightly smaller than the radius of the tire, it is because of the flexible part of the tire and vehicle weight due to the height a little lower. Please see tire picture below, red arrow is tire rolling radius. If the vehicle speed is known by speedometer, but no RPM gauge available. Then the engine speed can be determined by inverse of above calculation. Hi, this blog is really amazing and provide me answers to all my questions. This is really informative and I will for sure refer my friends the same. I got the freebies with the ComLuv premium and adding this now makes it all even juicier than ever. Many thanks for your visit and support for this site. Rgs Heru.